On May 14, 1970, Andreas Baader was violently freed from a correctional facility in the West Berlin neighborhood of Tegel. This paved the way for the birth of the first generation of the Red Army Faction [Rote Armee Fraktion or RAF], which crystallized around Baader, Gudrun Ensslin, Ulrike Meinhof, Holger Meins, und Jan-Carl Raspe. Their first programmatic statement was Ensslin’s call to arms, “Build up the Red Army!” [“Die Rote Armee aufbauen!”], which was issued in June 1970. The group first referred to itself as the “Red Army Faction” in Meinhof’s text “The Urban Guerilla Concept” of April 1971. (The group is also commonly referred to as the “Baader/Meinhof Gang,” after its two leading members.) After a series of bank robberies, car thefts, and document thefts, the RAF carried out a string of bomb attacks in May 1972, targeting the headquarters of the 5th U.S. Corps in Frankfurt am Main (May 11), the local police headquarters in Augsburg and the Bavarian state police headquarters in Munich (May 12), federal judge Wolfgang Buddenberg, the Springer publishing house, and the Heidelberg headquarters of the U.S. Army in Europe (May 24). Most of the RAF’s first-generation members were arrested and jailed in June 1972. 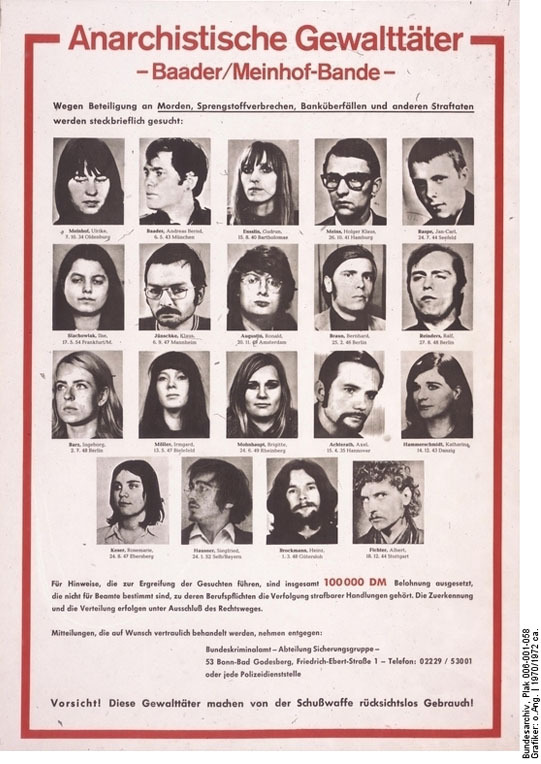 The wanted poster below shows (from the upper left to the lower right): Ulrike Meinhof, Andreas Bernd Baader, Gudrun Ensslin, Holger Klaus Meins, Jan-Carl Raspe, Ilse Stachowiak, Klaus Jünschke, Ronald Augustin, Bernhard Braun, Ralf Reinders, Ingeborg Barz, Irmgard Möller, Brigitte Mohnhaupt, Axel Achterath, Katharina Hammerschmidt, Rosemarie Keser, Siegfried Hausner, Heinz Brockmann, Albert Fichter. The heading reads: “Violent Criminal Anarchists – Baader/Meinhof Gang.” The text begins as follows: “The following persons are being sought for their participation in murders, bombings, bank robberies, and other criminal acts.” It continues, “Reward money in the amount of 100,000 Marks is being offered for tips leading to the capture of these persons. The reward does not apply to civil servants whose professional responsibilities involve the prosecution of criminal behavior. The award and distribution of this money will proceed without the possibility of recourse to legal action.